I had the joy and pleasure of performing and teaching at The Lone Star State Dulcimer Festival in Glen Rose, Texas last weekend. It had been about 23 years since I had been to this festival and it is just as fun and wonderful as I remembered. Thanks Dana! On Sunday at noon a group gathered and did some shape-note singing, often referred to as Sacred Harp singing. The Sacred Harp consists of the combined voices of all the singers; that is the instrument! I have heard Sacred Harp shape-note singing many times on recordings and several times sung by a small groups of people. I have always found it quite powerful and moving. This was the first time I had experienced a large group of people singing Sacred Harp. The repertoire comes from a number of 19th century hymnals. 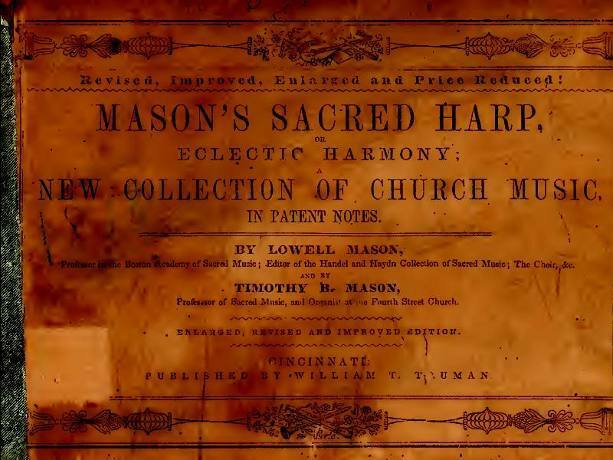 Two popular books are “The Sacred Harp, Or, Eclectic Harmony,” which you can read and download from the always wonderful Internet Archive and “The Southern Harmony And Musical Companion” which can be read and heard online. How wonderful that you are a shape-note singer! I may have to give it a go myself. Great raw, powerful stuff. Around here, we sing from Denson (the red book) most of the time, supplemented by the Cooper book (blue) and Norumbega (black), with forays into “the Christmas book” in December and photocopied sheets when someone’s written a new piece. Singing’s in Boulder this Friday. Not terribly far from where you used to live.